Before you cast that 93-year-old to the wolves. Before you accuse him of wanting have his cake and eat it too in the matter of that manifesto prime minister. Before you accuse him of doing things that he did not do and condemning him for the things that he did do. Pause for a moment and run this thought through your brain cells…those brain cells of yours that still does work! PUTRAJAYA: Tun Dr Mahathir Mohamad today announced he is quitting UMNO with immediate effect. The announcement was made at a press conference held at his office at the Perdana Leadership Foundation in Putrajaya this afternoon. “My decision to leave UMNO is because it is no longer UMNO, it is a party dedicated to support Najib (Datuk Seri Najib Razak), protecting Najib and upholding what he does. “I cannot be a member of such a party,” the former premier said. Dr Mahathir said his wife, Tun Dr Siti Hasmah has also quit the party effective immediately. From that standing start in February 2016 when Tun quit Umno, in just over two years, armed with nothing more than his agile mind and political savviness, he has taken the opposition into government, defeated Barisan Nasional and installed himself as prime minister. Now tell me guys…he is now in power. He is now the prime minister…..tell me… what can’t Tun Mahathir do if he sets his heart to doing what he wants to do? Today, like in the past, nobody challenges his leadership bar for some of Anwar’s running dogs who snapped forlornly at Tun’s feet without any success. Anwar dares not to stand up to anything that Mahathir has done and will do to him because if he does challenge and fail, tiada maaf for Anwar. At least this way of him waiting for the crown to be passed to him when and if Mahathir does do so….at least this way, Anwar might still have hopes to be the manifesto prime minister that Tun has told us Anwar will be if and when Tun decides that it should be so. Let me reiterate…it took Tun just a tad over two years to be prime minister of Malaysia from a standing start. 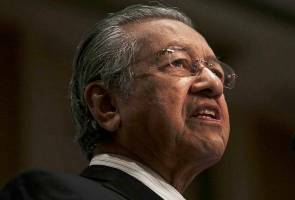 Now that he is prime minister, do you think Tun Mahathir can be made to do anything that he does not want to do? Them are the realities….and you guys and Anwar Ibrahim will have to live with those realities. We may have a say at the next general election but that is a few years away… and a few years in politics, is a long long time. Meantime all those align against Tun Mahathir….and there are many of them in PKR….are running around like headless chooks. I think by now Anwar and Azizah understands that maybe, just maybe, if they had done things differently….things might have been different for them! Too many lies, too many vested interests, too much greed and hubris….plenty of hubris! Nurul’s resignation had NOTHING to do with politics…there are some unresolved domestic problems to be addressed……problems that needs money to resolve. Good manners and grace prevents me from saying more….but really Brader Anwar…..you need to understand that we are now in a different era from the time that you were in in when you went into Sungai Buloh. Wake up to that reality and live your life accordingly. If you do not, others may not be like me who still understand that our time together in MCKK does count for something…. but even my patience is not unending. Now back to Tun Mahathir….so guys, do not try to second guess the old man. He has taken on Umno and won….surely everything else dwarfs that feat? Surely he now should earn the respect of his enemies and the admiration of you and me who have watched his rise and rise to political leadership (again) in the last two years! For now let us just wait for the time when Tun says he is ready to go. Until then all we can do is hope, that at 93, the old man understand what he has to do to make our Malaysia great again.